Earlier this year, Peru established Yaguas National Park, a 2 million acre Amazonian preserve that’s both a biodiversity hotspot and a spiritual nexus for local indigenous people. Its protection was the culmination of a battle hard-fought by indigenous groups and their many supporters—including a watercolour painter at the Field Museum in the US city of Chicago, Illinois. Macnamara’s studio at the Field Museum is what you’d expect from an artist obsessed with wildlife: Stuffed birds in glass domes, eggs nesting in display cases, and a kaleidoscope of stacked watercolour paintings of animals seem poised to suddenly animate into a jazz rendition of Fantasia. The colourful chaos would drown out the painter were Macnamara not so animated herself. She skips enthusiastically from topic to topic as she tells me how she came to find herself painting a case for the Yaguas Park. Long before Macnamara painted her first animal, the Chicago resident came to the Museum constantly to paint the ancient statues, pottery, and other exhibits in the Chinese artefacts section. After ten years, she’d worked her way through every one. “I always included the case. I didn’t pretend that it was in habitat,” Macnamara said. Macnamara’s style diversified with time. 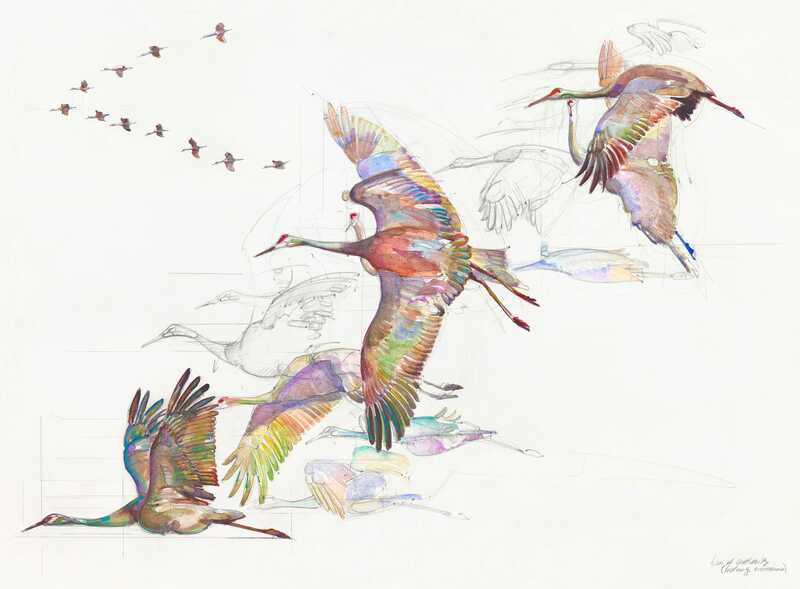 Occasionally, she would move from bird-as-exhibits to depicting the creatures with the “suggestion of habitat”—flocking through natural settings or even flying through the museum itself. Then, about 15 years ago, she was approached by Debbie Moskovits, one of the founders of the Museum’s conservation arm. Moskowitz eventually recruited Macnamara to work for the museum, and later, for the Action Center’s conservation initiatives. Since its formation 23 years ago, the Action Center has provided scientific support for 18 protected areas spanning 26 million acres. It was an odd move. Macnamara’s style was nothing like traditional naturalist’s meticulously labelled and anatomically precise sketches one might expect to find in a scientific document on conservation. She used watercolours like an oil painter. Since her first conservation assignment, Macnamara’s work has become an integral part of the Action Center’s conservation efforts. She’s painted everything from birds to mammals to alligators, and worked on several educational books with the museum, including one on native Illinois insects. Several new protected areas in Peru and Ecuador that the Action Center has supported have also had Macnamara paintings of their wildlife. The Action Center’s work on Yaguas began in the early 2000s, when it took up the cause the Instituto del Bien Común (IBC), a Peruvian NGO that works with indigenous people and had been crusading for the formation of network of parks to protect the region. A biodiversity hotspot boasting two-thirds of Peru’s freshwater fish species, the area is sacred to native peoples who fled to its outskirts to escape the horrors of the 20th-century rubber boom. They call it the “sachamama,” a Quechua word indicating its status as an incubator of the surrounding forests’ fecundity. Action Center scientists went to Yaguas to do a series of inventories of its wildlife. They dropped biologists into priority areas for a month to assess plant and animal diversity, in addition to sending social scientists into local communities to learn about their needs and priorities. “[A]nd then we bring that information together to try to protect these places in a way that make sense for those local people,” Vriesendorp said. According to Vriesendorp, the effort faced challenges at every turn, including blowback from illegal logging and mining groups. Eventually, however, Field Museum scientists along with the IBC and others convinced Peruvian officials. By the time the museum crew brought down an original Macnamara for a November 2017 meeting, former president Pedro Pablo Kuczynski had already expressed commitment to making Yaguas a park. The pieces, Macnamara tells me as she slides out two of the Yaguas paintings, were part a new chapter of muses for her: fish. 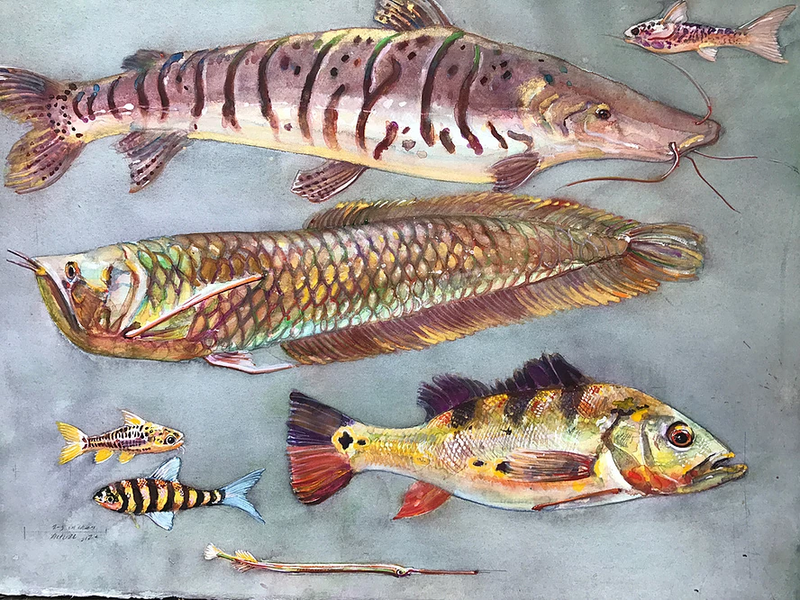 The first painting shows three stingrays, the second, seven fish, including a predatory arawana with its characteristic upturned mouth and icicle-esque body, a peacock bass, a catfish, and other Yaguas natives I can’t place. Compared to the grandeur of the life-size, rainbow-coloured painting of a massive arapaima Macnamara did for Guyana’s president, these seem unassuming. But Vriesendorp is right. To see them is to know there’s no need to question the value of her art. Rather, one can simply smile at the thought that with every new conservation initiative the museum takes on, scientists will be confronting lawmakers with stunning beauty.